The Menzies, Mickleover Court Hotel, Derby Derby hotel is a 4-star hotel offering a range of superb business, travel and leisure facilities – as part of an overall chain of luxury hotels around the country. It includes a range of dining and banquet rooms as well as conference, function and event facilities catering for weddings, celebrations and business events. The hotel also offers an indoor, heated swimming pool, gym, sauna and beauty room. We were asked to re-decorate a large number of their luxury suites and double bedrooms, as well as public access areas including stairwells, corridors and banqueting facilities. 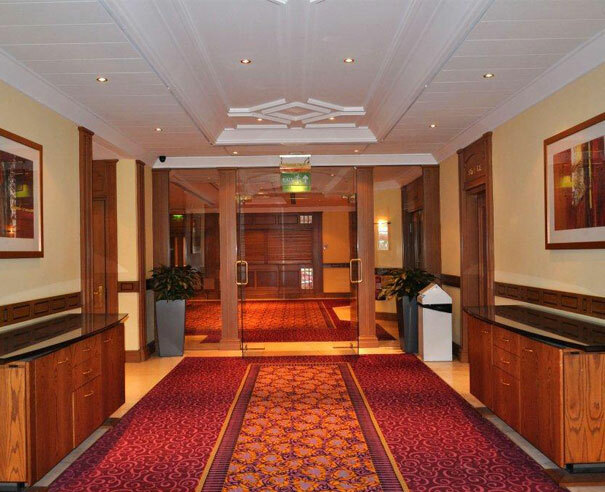 The works included specialist treatment to a number of doors – rubbing back, re-graining and wood-staining in the conference rooms; as well as re-painting the ceilings, walls and panelled walls. The works to the individual rooms included for totally re-painting the ceilings, walls, and woodwork in a range of chosen colour schemes to highlight the luxurious quality of the rooms. We also carried out works to the main pool area; changing room area and leisure bar area – works were carried out overnight to ensure that all the services were fully functional for guests during the day. All works were undertaken whilst the Hotel was fully operational, with minimum disruption and to tight deadlines and timescales to meet our client’s requirements. We continue to have an excellent working relationship with Menzies Hotels, and are currently undertaking further works on the Mickleover Court Hotel.